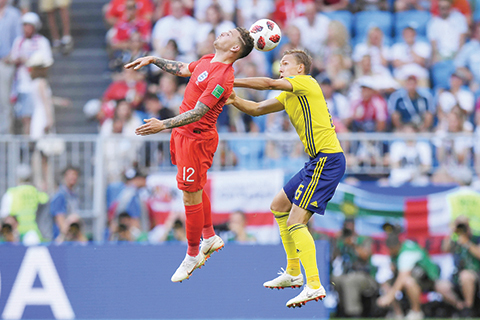 SAMARA: England defied almost three decades of disappointment to move confidently into the World Cup semi-finals for the first time since 1990 as headers from Harry Maguire and Dele Alli downed a dogged but toothless Sweden 2-0 yesterday. They were set on their way when Maguire rose imperiously to head home from a corner and Alli added the killer blow after the break as England showed they are not entirely dependent on the tournament’s leading scorer Harry Kane for goals. If anything, England’s hero on the day was to be found at the other end of the pitch as keeper Jordan Pickford produced three superb saves to shut out the workmanlike Swedes. While England’s victory was one-sided it was not easy. Sweden had reached the quarter-finals by making life hard for supposedly superior opponents and it was easy to see why after a dour opening when England looked incapable of stringing passes together against their hardworking opponents. It was predictable in many ways, therefore, that the deadlock was broken from a set piece. That was England’s eighth set-piece goal at this World Cup, but, while they are lethal from dead balls, apart from Kane they are not blessed with too many other sharp shooters. Forward Raheem Sterling has faced some criticism over his struggles to score for England and just before halftime his doubters were handed ammunition when he was twice left alone to bear down on Sweden keeper Robin Olsen. His blushes were saved by the linesman’s flag as he fluffed the first chance, but moments later he ran through again, this time trying to round the keeper, only to be denied once more. England were almost made to pay straight after the interval and would have been pegged back if Pickford had not produced a top-drawer save to keep out a Berg header. England had not kept a clean sheet in their four previous matches and had Pickford to thank for ensuring they did not concede this time. He saved superbly from Viktor Claesson before tipping a shot from Berg over the bar and that was enough to ensure Swedish hopes of reaching their first semi-final since 1994 were dashed.